Mr. Silverman is chief executive officer and an owner of 54 Madison Capital. From 2012 through July, 2015, Mr. Silverman was Chief Executive Officer of the real estate businesses of Guggenheim Partners, LLC. From 2007 through 2011, Mr. Silverman was Chief Operating Officer, a director, Vice Chairman of the Board and a member of the Executive Committee of Apollo Global Management. 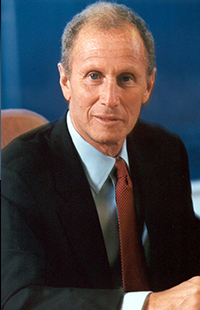 From 1990 through 2006, Mr. Silverman was Chairman of the Board and Chief Executive Officer of Cendant Corporation. During the sixteen years Mr. Silverman served as CEO, shareholder value increased by more than 2000%, six times the S&P 500 over the same time period. Cendant was a “Fortune 100” company and the largest global provider of consumer and business services within the travel and residential real estate sectors. Cendant’s subsidiaries included Wyndham Worldwide (NYSE: WYN), Realogy (NYSE: RLGY), Avis Budget (NYSE: CAR), PHH (NYSE: PHH), Travelport, Affinion, Wright Express, Orbitz and several others. In 2006/2007, Mr. Silverman conceived and executed a plan to separate Cendant into nine individual, now public, companies; the aggregate equity market capitalization of those businesses currently is in excess of $50 billion. Prior to Cendant, Mr. Silverman served as chief investment officer of two private equity funds: Reliance Capital Group from 1982 to 1989, and Blackstone Capital Partners I from 1989 through 1991. While at Reliance, Mr. Silverman founded Telemundo, the Spanish-language television network, where he served as Chairman and CEO. Telemundo was sold to General Electric in 2002 for $2.7 billion. Additionally, from 2002 to 2012, Mr. Silverman was a Commissioner of the Port Authority of New York and New Jersey, and served as its Vice Chairman; and is currently the Chairman of the Jacob K. Javits Convention Center. Mr. Silverman is also a Trustee of the NYU Langone Medical Center, and the former Chairman of its Board. Mr. Silverman is a former Trustee of NYU, the University of Pennsylvania, Penn Medicine, the Dance Theatre of Harlem, the Whitney Museum of American Art and the NYU Child Study Center; and was a member of the G-100 and the Executive Committee of the Business Roundtable.